Fig. 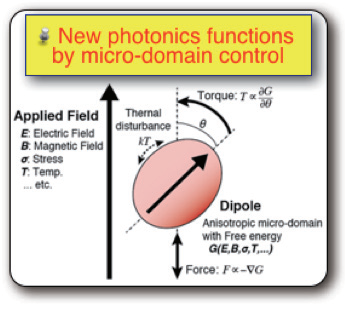 1 The concept of micro solid-state photonics as micro-domain controlled materials/devices. Fig. 2 Pulse width gap region of giant pulse lasers. Fig. 3 Extended wavelength by giant micro-photonics. T. Taira, A. Mukai, Y. Nozawa and T. Kobayashi, Opt. Lett. 16, 1955-1957 (1991). 平等拓範, 日本学術振興会 光エレクトロニクス第130委員会編「光エレクトロニクスとその応用」オーム社, pp. 177-189, pp. 189-222, pp. 247-266, pp. 289-314, pp. 422-442 (2011.5): レーザー学会編「先端固体レーザー」オーム社, pp. 33-96, pp. 97-147 (2011.12). T. Taira, J. Saikawa, T. Kobayashi and R. L. Byer, IEEE Journal of Selected Topics in Quantum Electrons 3, 100-104 (1997). H. Ishizuki and T. Taira, "Half-joule output optical-parametric oscillation by using 10-mm-thick periodically poled Mg-doped congruent LiNbO3," Opt. Express vol. 20, no.18, pp. 20002-20010 (2012). M. Miyazaki, J. Saikawa, H. Ishizuki, T. Taira, and M. Fujii, Phys. Chem. Chem. Phys. 11, pp. 6098-6106 (2009). S. Hayashi, K. Nawata, T. Taira, J. Shikata, K. Kawase, and H. Minamide, “Ultrabright continuously tunable terahertz-wave generation at room temperature,” Scientific Reports 4:5045 (2014). DOI: 10. 1038 / srep 05045. T. Taira, T. Y. Fan, and G. Huber, “ Introduction to the Issue of Solid-State Lasers” IEEE J. Sel. Top. Quantum Electron. 21, 0200303 (2015).